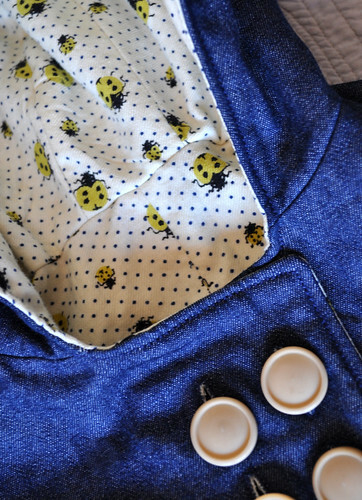 soft, dark denim and a cute, brushed, cotton drill, lining with limey-yellow lady bugs. it feels so great to use this lining, proof that i actually DO need all the fabric in my stash. i found it at a local op shop a couple of years ago and immediately thought it would be a perfect lining for a dark denim or navy blue coat. ta-dah! this is one of the patterns i bought on etsy and it was really quite easy, only taking me about four hours (and that included quite a lot of time staring at the instructions, trying to figure out just how on earth i was supposed to attach the lining on the sleeves). i think i might tackle another one once i get a few more things knocked off my list, i found an awesome, dusty pink, plaid wool at st vinnies earlier this week that is screaming "winter coat". love this so much! I think I need to start chipping away at my fabric stash this week! Lovely jacket - and lovely lining. I remember staring at the instructions wondering the same thing when I made a jacket last year, but it does work. Um, so I'd love one of these in adult form! De.Light.Ful! Too cute! Great job!! My girls would freak over the ladybug lining. Every time they see a ladybug they have to have a tupperware and a magnifying glass. Wonderful sewing! 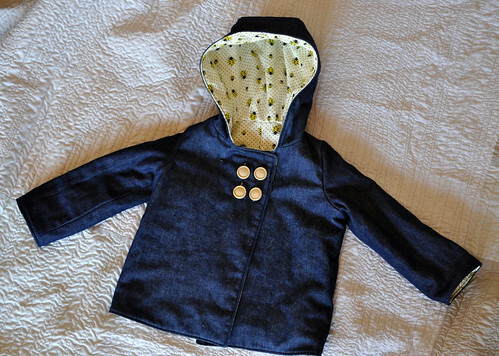 What an absolutely lovely jacket - Mae will treasure it, I'm sure!!! What a treasure. You mention a pattern bought on etsy, but I don't see any specifics in this posting. COuld you post a link? I would love tho make two of these for my little twin boys. sorry about that, madeleine! i've updated the post with a link now. there are lots of other tempting patterns in that shop too... if only i had more time! What an amazing little jacket. It's inspiring me to cut into some of the denim and wool I've thrifted over the years too. Cute lining. oh i love the jacket! I've actually been eyeing those patterns for awhile and I love how the denim gives it a different look. I'm sure Mae will love it! Hello! Just popped over from my blog to yours. This jacket is the cutest. Really looking forward to having a proper trawl through all your work if I get a moment to myself sometime.